Since 1996, In late March, the weekend of the equinox, Suwannee Springfest continues to kick off the spring festival season at The Spirit Of Suwannee Music Park in Live Oak, FL. A gem of a festival with beautiful early spring weather in a stunning natural setting, Suwannee Springfest consistently features a stellar lineup. Festivalgoers experience four days of superb music in the midst of a friendly, family-style environment with good times including music from usual festival favorites, as well as lots of talented new faces in Bluegrass & Newgrass, Acoustic Blues, Roots Rock, Singer/Songwriter, Cajun/Zydeco, New & Traditional Folk and other forms of American Roots music. Also keep an ear out for some campground pickin’ and join in on the fun! 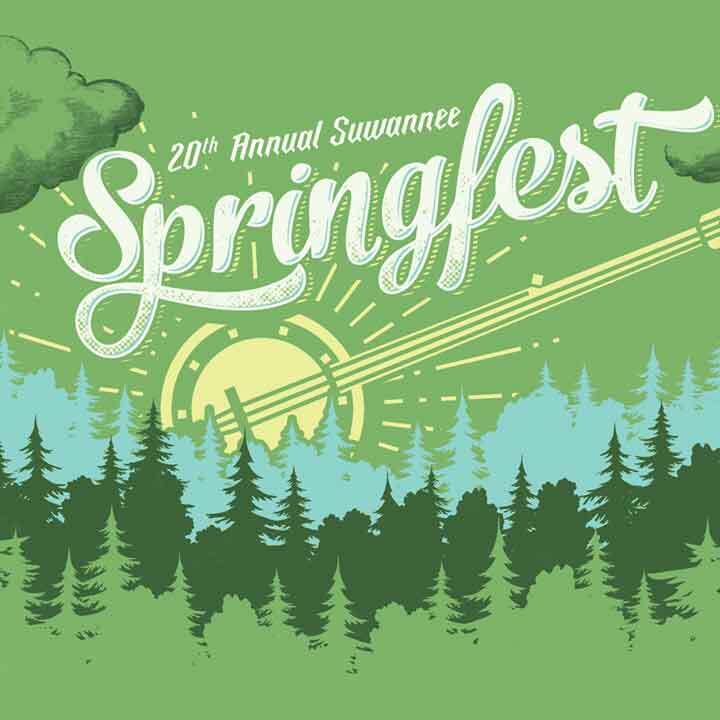 Performers at Suwannee Springfests pass have included Del McCoury Band, David Grisman, Hot Rize with Red Knuckles and The Trailblazers, Vassar Clemments, Richie Havens, Mavis Staples, Bela Fleck, Abigail Washburn, The Punch Brothers, Lucinda Williams, Jason Isbell, The Avett Brothers, Shovels and Rope, John Hiatt, Peter Rowan, Guy Clark, Verlon Thompson, Blind Boys of Alabama, Sam Bush, Tony Rice, Jerry Douglas, The Derek Truck Band, The Wood Brothers, Justin Townes Earle, Leftover Salmon, Greensky Bluegrass, Steep Canyon Rangers, Larry Keel, Yonder Mountain Stringband, Jeff Austin, Donna the Buffalo, Jim Lauderdale, The Duhks, Blueground Undergrass, The Lee Boys, The Infamous Stringdusters,Shinyribs, Col Bruce Hampton, The Emmit Nershi Band,Shannon Whitworth, Mike Marshall, Darol Anger, Vasen, David Gans, Town Mountain, Nikki Talley, The Shook Twins, The Recipe, The Overtakers, Snake Oil Medicine Show, Tornado Rider, Seth Walker Band, Cabinet, Ralph Roddenbery Band, Grandpa’s Cough Medicine, Virginia Dare Devils, Whetherman, Flagship Romance, The Applebutter Express, Sloppy Joe, Big Cosmo, Grits & Soul, Quartermoon, The Josh Daniel/Mark Schimick Project, Steve Pruett’s Back from the Brink and many more! 20th Annual Suwannee Springfest is taking place March 17-20, 2016. Get your tickets now! Click HERE.